Rinse the peeled corn thoroughly. Shave the corn kernels off and place in a food processor or blender along with the sweetened condensed milk. Process until you get as smooth consistency as you can. Incorporate the corn meal or rice flour until you get a moist, but not wet, dough consistency. Season with the cinnamon and salt and mix well. To prepare the tamalera or steamer: Place water in the bottom pan of a steamer (so that water is under the steamer) and bring it to a simmer. Line the steamer with one or two layers of soaked corn husks. To assemble the tamales: Lay out a corn husk with the tapering end towards you. If the fresh corn husks are too thin, use 2 or 3 fanned together. Spread about 3 tablespoons of dough or masa into about a 2 to 3-inch square, the layer should be about 1/4-inch thick, leaving a border of at least 1/2-inch on the sides. Pick up the two long sides of the corn husk and bring them together and fold the folded sides to one side, rolling them in the same direction around tamal. Fold up the empty section of the husk, with the tapering end, from the bottom up. This will form a closed bottom and the top will be left open. Prepare all the tamales and place them as vertically as you can in a container. To cook tamales: When you have all tamales ready place them, again as vertically as you can, into the prepared steamer, with the open end on top. 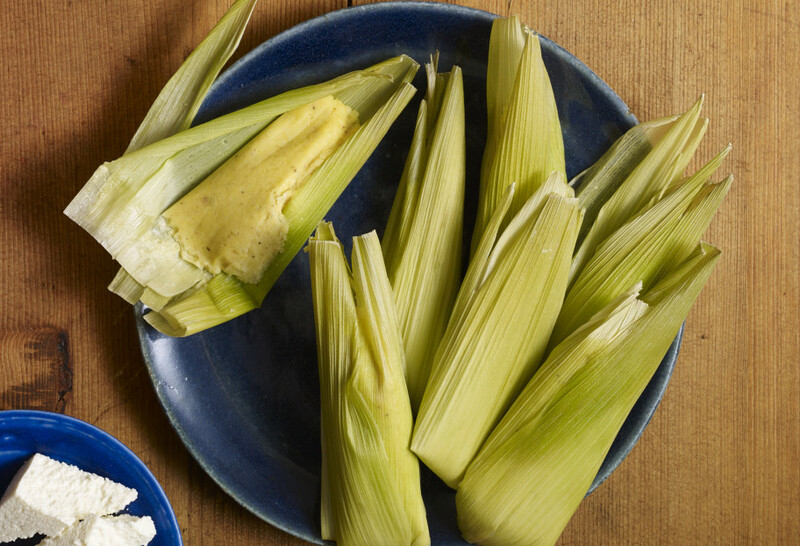 If there is space left in the steamer, tuck in some cornhusks, so the tamales won’t dance around. Cover with more cornhusks, and steam covered with a lid anywhere from 55 minutes to an hour. You know the tamales are ready when they come easily free from the husks. Serve hot, along with fresh Mexican cream and crumbled queso fresco on the side. So if you can’t find fresh corn can you substitute frozen or canned? I wouldn’t want to but if all else fails. Also, what kind of yield do you get from 10 ears approximately (in cups)? Thank you for your recipes! I love your cookbooks….working on a collection here and have made plenty…..still need to try your guava cheesecake! Pati- Thank You for this recipe! I had these years ago in Cuidad Guzman (outside of Guadalajara).There was one lady that made them every Saturday & they sold out very quickly. Love your show! Keep up the great work! Oh what a great memory, Lydia. Enjoy the Uchepos! I am in love with your tamale recipes, always successful for me. However, when I attempted to make these I could not manage to get the correct consistency. After adding 2 1/2 cups of corn meal I finally decided to just wrap the filling and see what happen, concerned they would be too dry upon steaming. They were still leaking liquid all over the bottom of the bowl once i finished wrapping in the corn husks…haven’t steamed them yet but what do you think I could be doing wrong? I watched the video for this episode and the filling seems to be pretty thick. I waited about 5 minutes between each addition of corn meal to give it time to absorb the excess liquid as suggested on the video. Any input would be welcome, thanks Pati! It is tricky because this dough really depends on how watery the corn is… try mixing it with some corn masa harina flour! We recently visited Morelia and dined at Lu’s wonderful restaurant at the Hotel Casino. We loved the tarascan soup and the poblano stuffed with uchepos. Would your uchepos recipe be a good filling for poblanos? If so, what sauce would you drizzle on top? Lastly, do you happen to have a sopa de tarasca recipe that you’d recommend? Gracias. They would make a perfect filling for poblanos, Ed, but they have to be baked or steamed, so the uchepo masa cooks. And I would drizzle Mexican crema and sprinkle the stuffed poblanos with crumbled queso cotija​. And here’s my recipe for Tarascan Soup: https://patijinich.com/recipe/on_a_soup_and_a_book/ Enjoy! Hello, Dear One! I think it would be helpful to know how many actual cups of corn you are using. Sometimes you get big ears of corn and sometimes small ones and that would change how much corn or rice flour you are using. Just a thought. I LOVE YOUR FOOD. You are adorable and so are your boys. HOLA PATI…ME ENCANTA SU PROGRAMA…GRACIAS POR PONER EN ALTO MEXICO Y SUS RICAS COMIDAS..MI ESPOSO FACINADO Y CONOCIENDO MAS DE NUESTRAS COMIDAS , CULTURAS Y TRADICIONES…NO ME QUEDAN IGUAL PERO INTENTO…GRACIAS Y MUCHAS BENDICIONES. ..
Seguro que te quedan deliciosas, Irene! PATI DIOS TE BENDIGA GRACIAS POR COMPARTIR TUS RECETAS Y EL AMOR A LO QUE HACE…ME ENCANTA SU PROGRAMA Y SUS RECETAS. Can frozen corn be substitued for fresh corn? ¿Hay una diferencia en la calidad de la masa fresca? Tenemos una tienda local que tiene fresco. Claro, mejor usar masa fresca para la mayor parte de os tamales. Pero los Uchepos no se hacen con masa nixtamalizada, si no con elote tierno fresco. Lo puedes combinar! Gracias por su ayuda, en la Florida tenemos muchas familias Cubanas. Tal vez un espectáculo en recetas de fusión de Cuba y México. Can I use corn masa instead of corn meal? Yes you can, you can also use rice flour. Hola Pati, I tried making the tamales, but they came out to sticky. They were good, but they stuck to the corn husk after they cooked. Any idea what I did wrong? Help? Pati, puedo usar elotes de bote ? Can I use American yellow corn meal for this or is it a particular Mexican corn meal? Thanks for this recipe! American yellow corn meal works perfectly, Jessica, hope you enjoy!